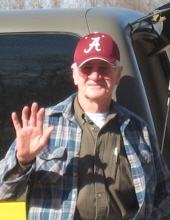 Mr. William Samuel (Bill/Billy) Turpen, 87, of Anderson, AL died Saturday, January 12, 2019 at his home after an extended illness. Bill was born in Bonnertown, TN on August 18, 1931 - the 10th of a family of 11. He was a retired employee of Reynolds Metals Corporation and a Veteran of the United States Navy. He was a member of Hurricane Springs Primitive Baptist Church in Anderson, AL and was active in volunteer work for the church performing whatever duties were needed along with maintaining Anderson cemetery. He was a resident of Anderson most of his life and was elected the town’s first mayor in 1973. During his terms as mayor, he spent numerous hours supporting the Anderson Fire Department and Rescue Squad; also serving as an EMT. He was an active member of the American Legion Post 0168 in Anderson. Bill loved his family. He was a supportive and loving son; a supportive, loyal and loving husband and daddy; a caring brother and uncle; a carpenter; a painter; a wood carver; a mechanic; an air conditioner repairman; a caregiver and the list goes on. He loved to garden, planting all types of vegetables and was ahead of his time as an organic gardener and naturalist. He was a jack of all trades and could do anything he set his mind to do. He tried to present positiveness with anyone he met - "can't never could do anything" was something he always said and he tried to live by it. He was known and greatly admired for his early athletic abilities, the importance of daily exercise, and was an avid researcher on nutrition and health maintenance. He never gave up on anything and supported so many with whatever they needed. His drive to fix things included the fight he had with Alzheimer's...he never gave up and fought it until his last breath. He will be truly missed in so many ways. Bill's survivors include his wife of 56 years, Mary Frances Hammond Turpen; one daughter Nancy Ellen (Mike)Tolliver; one grandson John Matthew Tolliver; three sisters Louella Mae “Lou” Frazier of Southaven, MS, Frenchie Marie Marston of Lawrenceburg, TN and Carolyn Sue Hester of Memphis, TN and a host of nephews and nieces that he loved as if they were his own children. He was preceded in death by his parents Robert Orville "Rob" Turpen and Dillie Mae "Dill" McCafferty Turpen of Bonnertown, TN; Ruby Nadine Thomas of Five Points, TN; Okerleen Juanita “Okey” Howorko of Detroit, MI; Margreet Jeanette Walker of Grassy, AL; Amon Paris Turpen of Germantown, TN; Eva Eleanor "Elena" Larson, of Nashville, TN; Orville Underwood Turpen of Ocala, FL; and Mary Hannah Wilkewitz of Detroit, MI. Visitation will be at Rogersville Funeral Home on Wednesday, January 16th from 12:00 p.m. to 2:00 p.m. followed by the Funeral at 2. Burial will be at Grassy Cemetery in Grassy, AL. Tim Cunningham will be officiating. To plant a tree in memory of William Samuel Turpen, please visit our Tribute Store. "Email Address" would like to share the life celebration of William Samuel Turpen. Click on the "link" to go to share a favorite memory or leave a condolence message for the family.